Great job! I’m amazed how well the cockpit tub fit. Great job at the cockpit! Thanks guys! Time for a timely tutorial. The first order of business is to remove the casting block from the bottom of the main pit. Using the fuselage sides as a guide, cut off the bottom block with a razor saw so that you have at least 3/8” of clearance on the bottom. Be careful as you hold the resin to not knock off any fine detail with your hands. I usually cut down half way, then flip the pit over and cut from the other side to meet the cut half way. 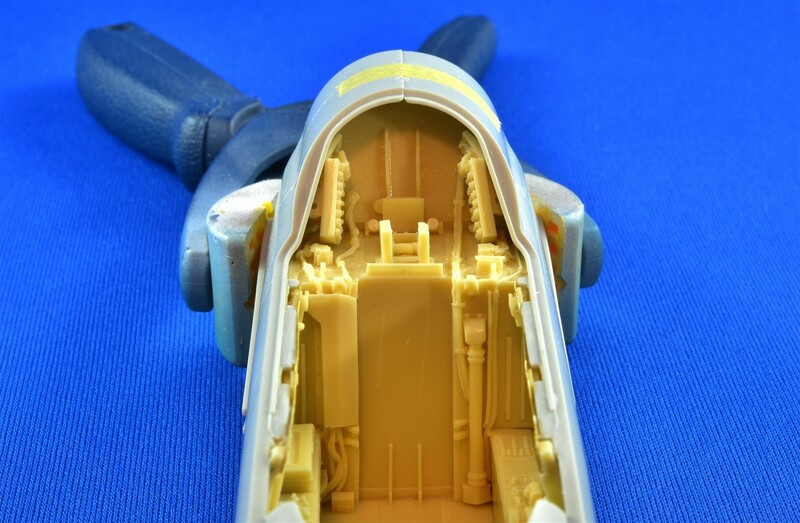 This clearance allows you to adjust the height of the pit within the fuselage, but also to tilt it front to back, as later required. If you’ve got lots of clearance to begin with, skip this messy and dust filled step. 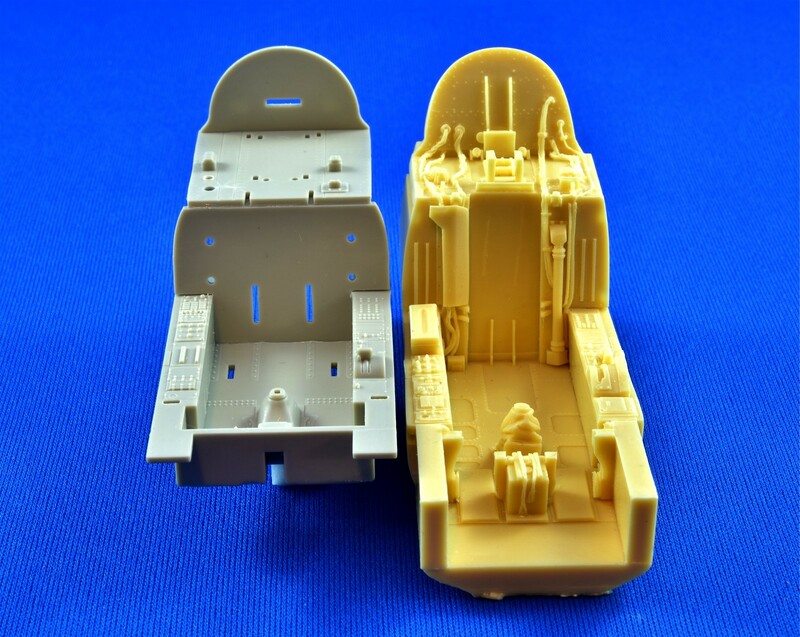 Tuck the pit up high on one fuselage side to see how it meshes with the kit plastic. Trim it with the #11 knife accordingly to get a snug fit. 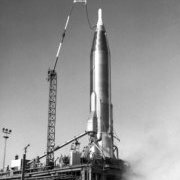 When you’re happy, attach the pit to the other fuselage side and do the same thing. 1. 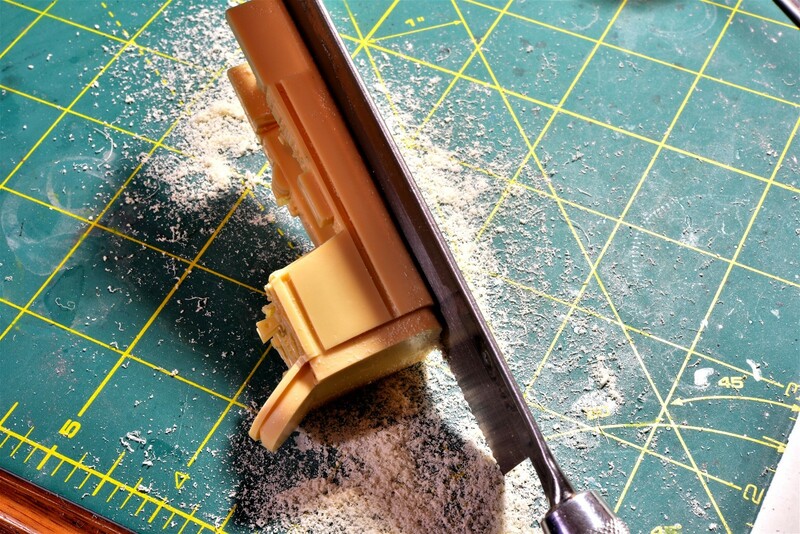 Take off as little as possible, which means that you should sand off the resin in thin layers, dry fit, then shave off some more. This might take 20 or more iterations, so take your time! 3. ALWAYS get the parts to fit snugly without squeezing the fuselage together too hard. 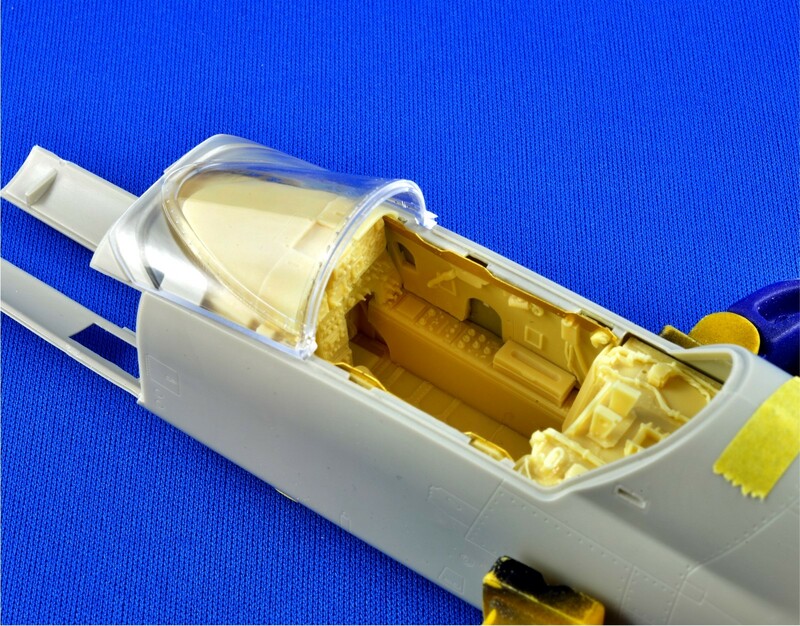 If you do, the fuselage can become swelled and other subsequent parts, like canopies and windscreens, may not fit later. The Forward and Tilt positions may involve dry fitting the Instrument Panel (IP) at the same time, to get it in the correct position. After a lot of dry fitting, trimming and a bit of cussing, you should be ready to deal with the cockpit walls. With the pit dry-fit installed the way you want it with shims and tape, try to fit a sidewall to one side. If you’re lucky, it’s a bit too tall and if you’re super lucky, it fits right away. Using the #11 knife, carefully shave off bits of resin here and there on the sidewall to get the wall to fit snugly against the pit on the inside, rather than the outside, which causes gaps. When you’re happy, mark the exact position of the sidewall and the pit with a pencil, then move to the other side of the cockpit and do the same thing with the other wall. Next, try to dry fit almost everything at the same time, including the IP and maybe other bits that might get in the way. You will likely have to do other adjustments to get all the parts to be happy with each other. 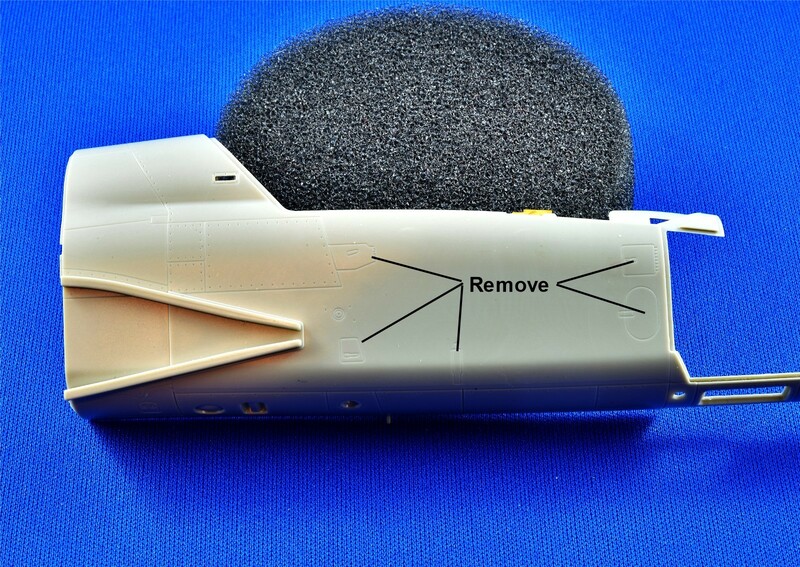 When they are, glue the sidewalls to the fuselage halves according to your pencil marks. 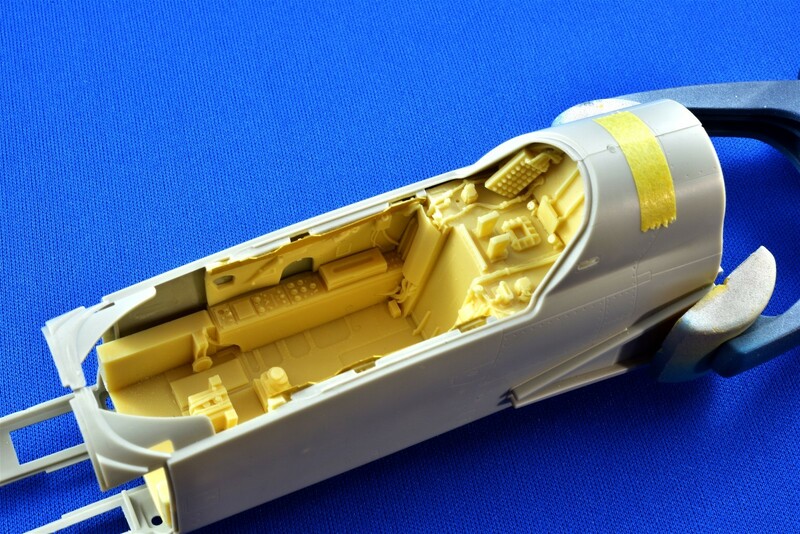 Next, paint the sidewalls and cockpit separately, including many of the tiny parts that may be easier to paint off the cockpit assembly than on it. 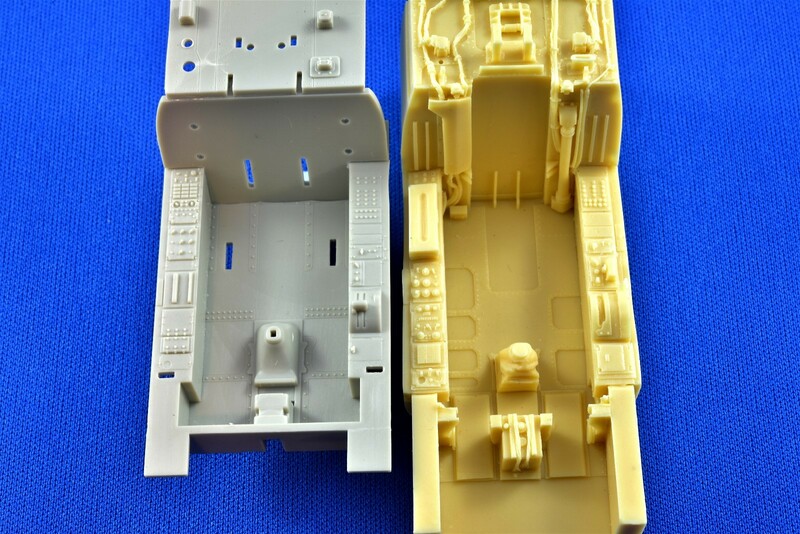 After you have decaled, assembled, detailed and maybe weathered your little work of art, it’s time to glue the cockpit in. This is when you need to focus on the pit to fuselage attachment more than the fuselage to fuselage join, because you can’t do both at the same time. With the cockpit dry fit in place with the fuselage halves held together with tape, using shims and tape again to get it fitting just right, ooze thick CA glue down the sides of the pit where it will bond with the fuselage plastic, using gravity to guide the flow, but not run down into any exposed areas. 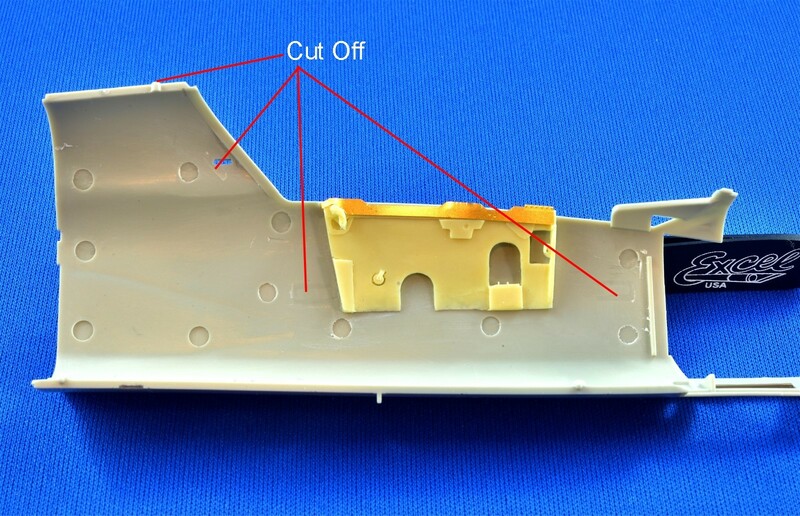 In most cases, the styrene shims can be glued with the rest of the plastic, assuming they won’t get in the way of other kit parts later. 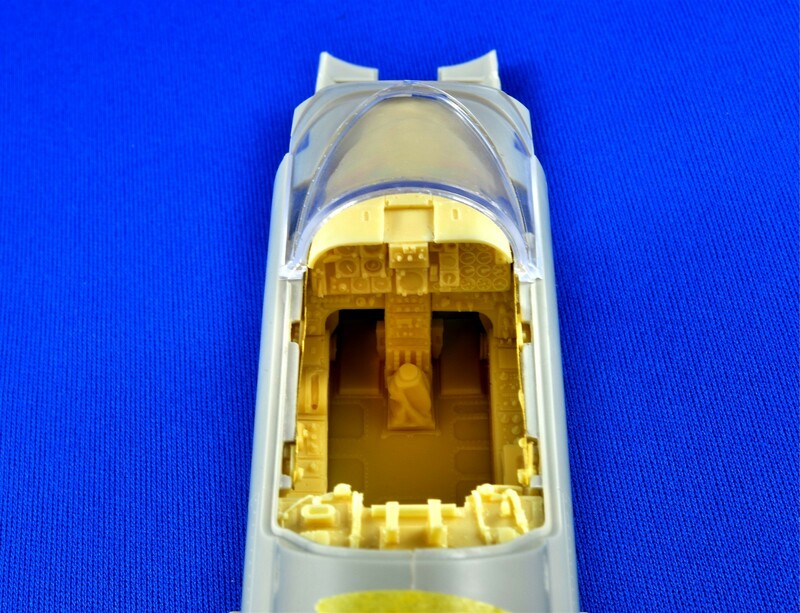 Hit the glue with CA accelerator, then glue another area, until you have filled much of the voids around the cockpit. Be very careful obviously, because there is no turning back. 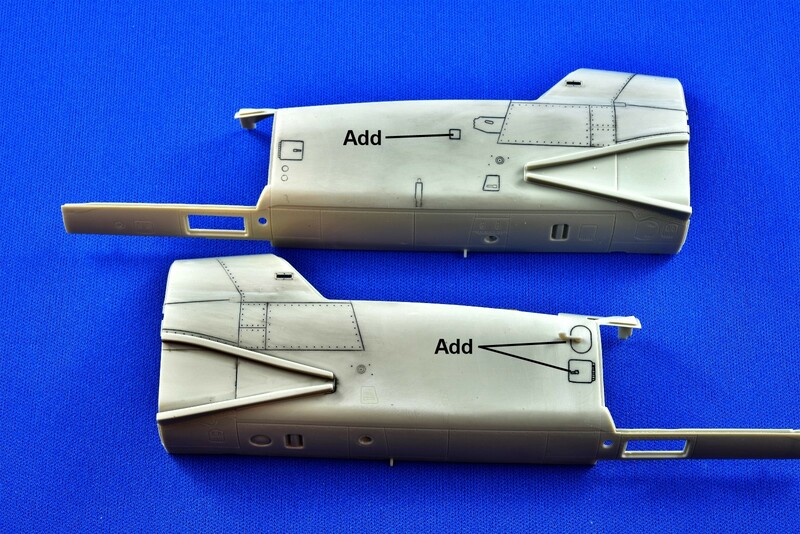 Now you can glue the fuselage halves together. 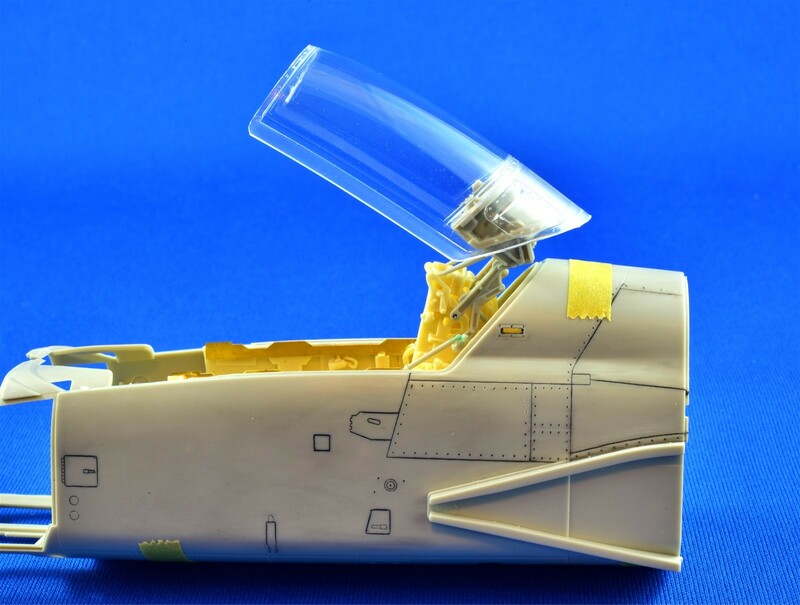 Using a used #11 knife blade, spread the plastic fuselage halves apart and ooze Tamiya Extra Thin cement in the gap, then let the mating surfaces fuse together as you move the blade along the seam, repeating this process in a zipper-like fashion until all seams have been glued together. After that, you guys know all the rest! Good luck and if you have any questions, fire away. You are off to a killer start so far Chuck. Can't wait to see how this goes! 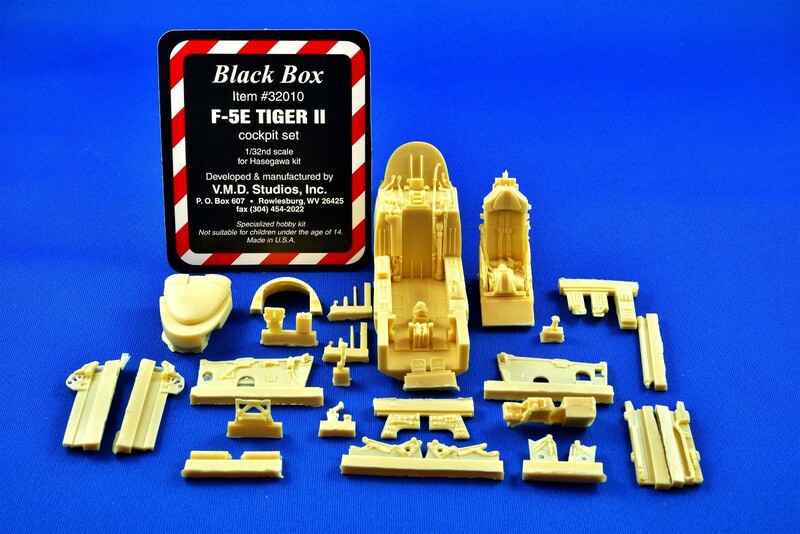 I just found a Black Box cockpit for my 1/32 Trumpeter F4U-1D Corsair so I know what you mean about the really bad instructions... 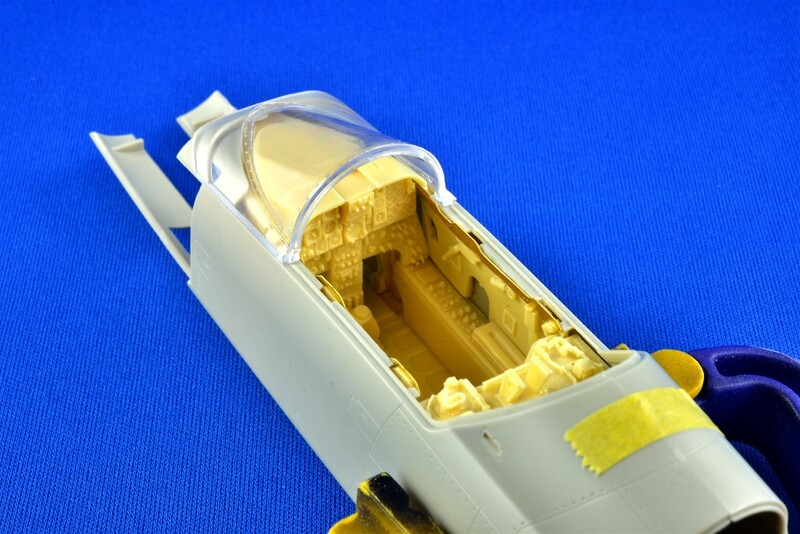 Your F-15 cockpit - wow!! Wow, that was quick, right back in the saddle again. Following along as usual Chuck. Excellent start bud. You are off to another winning model. Your tutorials are very helpful to the rest of us and I have certainly profited from them. 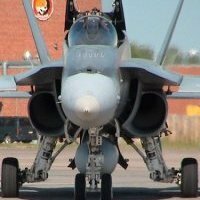 Could you possibly post a photo or two of your photo set up? I have a photo set up, but I find it very cumbersome to set up and tear down and it interferes with getting at other things in the basement. I'm looking at a more efficient way to do things. I know you have a photo booth/tent, but I would like to see how you position your lights around it and what the base may be. Your photo work is excellent. Any photos, help, suggestions would help a lot. Thanks Bob, I will. I get asked this same question now and then, so I'll do a quick tutorial in a few days with pics of my setup. Here you go Bob! I am not really a big photographer myself and my camera knowledge is limited, but over time, my pics have improved along with my modeling skills as I learn new tricks through trial and error. To me, taking good pics of our models is mandatory if you are going to display them here, because if I see a model build with crappy pics taken from a phone, I just move on, because you can’t tell if the modeling is good or not. Below is a cut/paste of a tutorial I did 6 years ago, updated with my current views, with asterisks on what I think are the most important items. The first thing you need is a decent camera, but owning a fancy DSLR with all the bells and whistles isn’t necessary, but it sure helps. 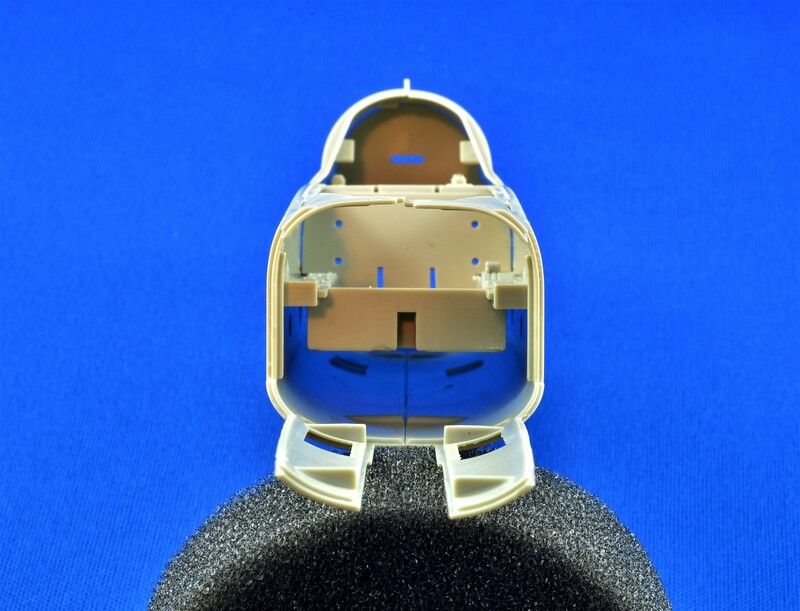 Besides having a good lens and decent resolution of at least 8 MP, the camera needs to have an aperture priority setting, so that you can fix the aperture to a high number, giving a small aperture. The camera also needs to be able to focus on objects from a minimum of 2 feet or less. Zoom lenses help if you need to be further away, but maximum aperture settings often deteriorate as you zoom in. Most point and shoot cameras have a macro setting which is often displayed as a flower for close-ups, but just make sure you can adjust the aperture at the same time if you leave it on this setting. For the record, I use a full frame Nikon D610 (24 mp) with a 60mm Micro lens for 90% of my shots and occasionally my Nikon D810 (36 mp) for completed model shots. If you can afford it, buy a dedicated “Macro/ Micro” lens and always focus by hand. Some of the shorter fixed lenses of 50 mm or less work well too, but most zoom lenses don’t have f-stops high enough at the focal lengths you want and sometimes they have distortion. That’s why they still sell fixed focal length lenses, often at much higher prices that zoom lenses: They quite simply take better and sharper pictures. Auto-focus should be avoided, because the camera usually locks onto something you don’t want in focus, rather than the area you do. A maximum aperture of “f-22” or higher is recommended for most model photography. With high aperture settings, you can achieve good depth of field, which is critical for close-up or “macro/micro” photography. If you are taking a close-up of your model from, say, 1 foot away at f-3.5, the object you focused on will be in focus, but the parts of the model just in front or behind the focus point will be blurry. With a higher aperture number of f-22 or higher, almost everything a few inches in front and a few inches behind the subject will also be in focus. My macro lens on my camera has a very high maximum aperture of f-36, so almost everything is in focus without any fuss. The next thing your camera needs is a self timer and the ability to fix it to a tripod. With high aperture settings, the shutter speeds will decrease dramatically, so you can’t hand-hold the camera without getting some blurring from shake. Anything longer than about 1/100 of a second will likely have some blur, but you can sometimes hand hold 1/60 of a second if you’re very steady. For maximum apertures of f-22 or more and the lighting I routinely use, my shutter speeds are often one second or more, so a tripod is a must along with a self timer, so that you are not touching the camera when the shutter is released. There are now a lot of LED light sources that do the same thing and although they are more expensive, the prices are starting to come down to the affordable level. Colors will shift according to your light source. 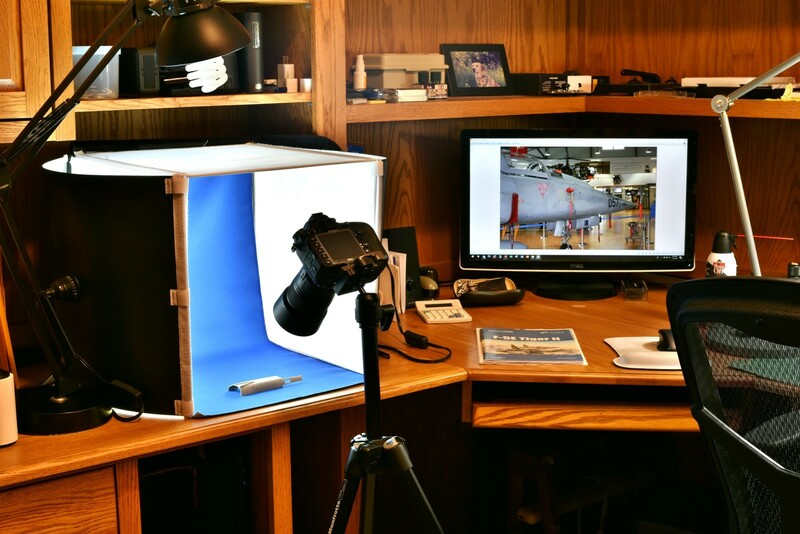 Fluorescent lighting is greenish in color, incandescent lighting is reddish and natural sunlight is neutral, which is why many modelers take their pics outdoors. You can hand hold many outdoor pics due to the strong light and resultant fast shutter speeds, even at high apertures, but strong sunlight can also produce too harsh shadows, so a cloudy day is often better than a sunny day to take pics. If you’re taking pics under artificial light, you need to compensate for the color shift of your light source and many cameras have a white balance compensation setting, other than “auto”. More sophisticated cameras allow you take a measurement of the colors your light source is sending to your model, by taking a picture of a white card (sometimes grey) as a base line for what is supposed to be pure white, which is saved as a setting in the camera. The pics you take are then color shifted accordingly to provide a neutral look, rather than one that is red looking because you used an incandescent light bulb, etc. This is the sensitivity of your digital light sensor, with low numbers of 100 to 400 being the most commonly used. ISO settings in this range will give your pics the most resolution, but sometimes you need a higher ISO setting to get the pics you want under poor light. High ISO settings, however, tend to be grainy, with the higher the number the grainier the pic. My camera goes to a smoking high setting of 12,000 (and higher), but the pics will look fairly pixilated. If you have good light and a tripod, you don’t need to worry about using a high ISO setting, so you should leave it as low as possible. 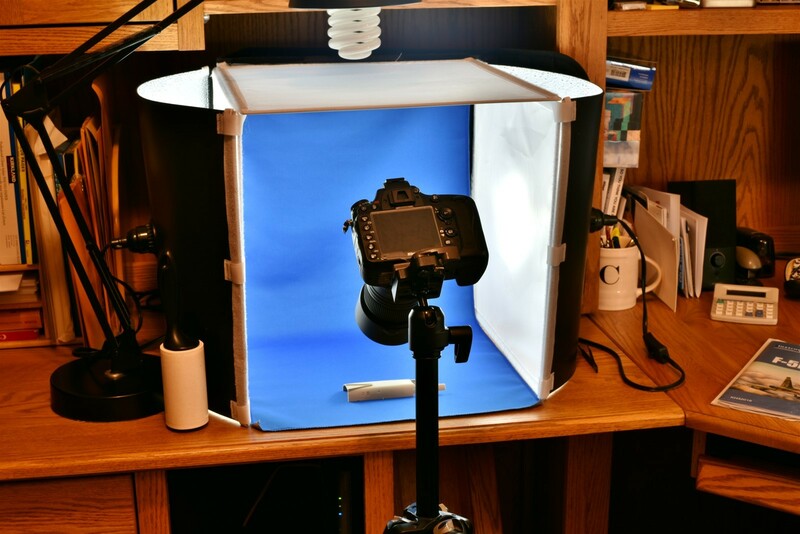 If you own flash umbrellas and light tents, you know a heck of a lot more about photography than I ever will, but for most people who use the built-in flash on their camera, my advice is to leave the flash down and never use it. Flashes tend to totally overpower the front light of the photograph, making them look artificial and washed out. With adjustable external flashes you can bounce the light off the ceiling, etc. to create a more natural look, which might work great for some. I like to use my own external lighting so that I can see what the pic should look like before I take it, rather than what it might look like with a flash. Many cameras give you options for how the light is measured on your light sensor, from tiny “spot metering” to versions that measure a wider spectrum in your viewfinder. I generally use the spot metering option, because I can control where the lighting is measured. This isn’t all that important due to “bracketing”, which I also use. Most of the time your pics will be properly exposed automatically, but sometimes you might want a little bit darker or lighter pic as a comparison to choose from. I used to also shoot 1 “stop” under and 1 stop over what the camera measures as correct, so that I had 3 pics for every shot, then chose the best one and deleted the other two. My camera does this automatically if I set it this way, but you can always do it manually if your camera doesn't have this capability. I sometimes find that the slightly overexposed pic is the best and sometimes it’s the under exposed one, so it's good to have choices. Most DSLR’s have some auto compensation for HDR, to smooth out the dark areas and very light areas of a photograph, but a true HDR photograph on my Nikon camera takes 3 different pics then stitches them together into one, automatically. This is the single biggest discovery I have made recently, that has improved my photography of models the most. To do this properly the camera should be on a tripod to eliminate camera shake, which it already is for the reasons above. The camera takes a properly exposed pic of the very bright areas, then one of the average areas, then a third of the dark areas, then combines them into just one photograph. Under strong light, close-up photography often has very light and very dark areas in the same pic, so the average of both is measured and taken, which can sometimes still look wrong. Ideally, you don’t want to see anything in the background, because it can distract from the model. Having all sorts of modeling crap in the background for an in-progress shot can add some nice realism to your photography, but for a finished model, I want to see nothing but the model and maybe the diorama the model is placed on. 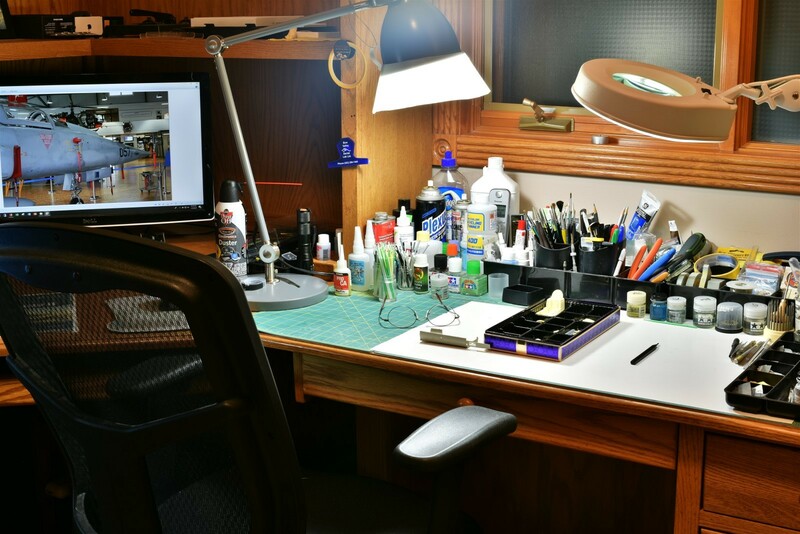 To accomplish this on a finished model, I use a very easy and cheap background, which is a large roll of white poster paper that is placed on the flat surface like a desk or table and draped up and taped to the wall behind, so that you can’t see any folds. Since your photograph is focused on the model, the background will be slightly out of focus, achieving a nice “nothingness” to the background or as the pros call it, “Bokeh”. For in-progress shots, I usually use a blue background, which creates a strong contrast with the grey plastic parts, making them “jump out” in the pic. All pics can be improved and enhanced with photo editing software. Contrast, brightness, shadow compensation, histogram manipulation, color shifting, cropping and sharpening are some of the more common things tweaked after you take the pic. This step is VERY important, because every single pic I take is improved significantly by doing so. This all takes some practice to get it right and there are many software packages out there, but I quite like the standard, free and easy to use “Windows Live Photo Gallery” that comes with Windows 7 and you can also download for free for Windows 10. I’m sure there are free Apple versions that are equal, or you can step up and buy the Adobe Photoshop software if you want to get really serious, although I never have found the need so far. In this pic of my recent Spitfire, I am using a fairly middle of the road aperture of f-14 that is focused on the engine only. It is clear and the foreground wing is not, which brings your eye to just the engine. For this deep shot, I’m using my maximum aperture of f-36, which keeps the front of the prop all the way back to the front of the cockpit in focus. Normally, the engine would be in focus and nothing else. Same for my Eagle. Just about everything is in focus, even though there is lots of depth and potential focus points. 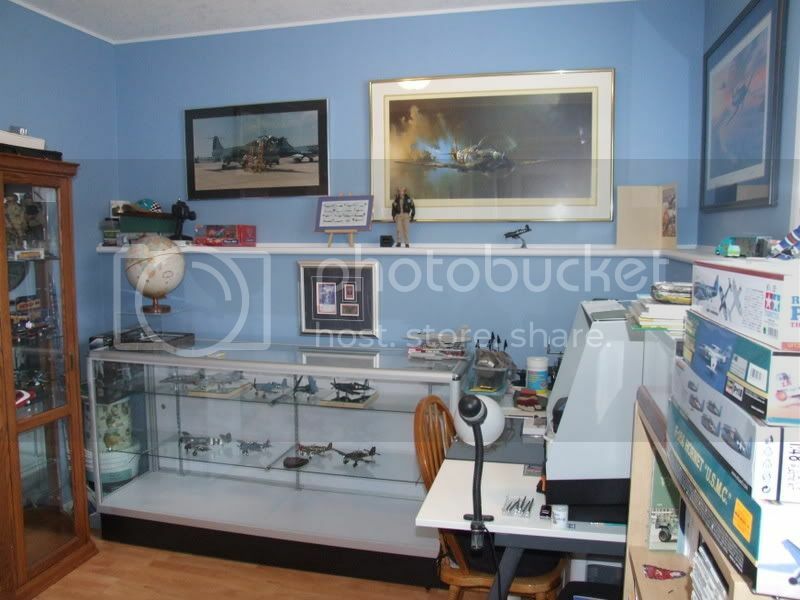 FYI, Here is my modeling work area and a computer screen with details of the starboard side of an F-5E, which is quite wrong on the KH kit, that I am currently changing. On the other side of the screen is my small photo-booth, where I take all of my in-progress shots. 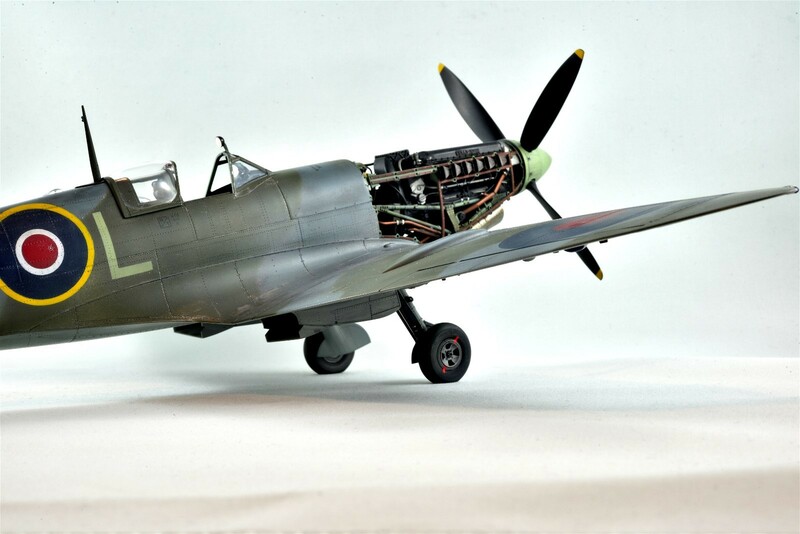 For 1/48 scale or small 1/32 models like my Spitfire, it’s all I need, including the shots of the finished model. 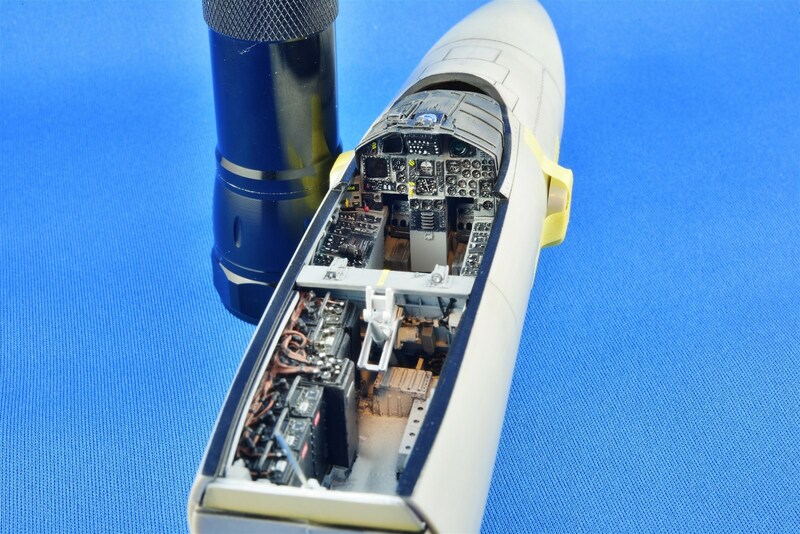 For my huge 24” F-15C Eagle, sub-assemblies are OK, but the final shots of the model must be taken elsewhere where I can stretch out a larger background. This little booth has a small light on either side that usually provides enough lighting for my pics, especially with the HDR settings I use. For some applications where I need more light, I turn on the goose-necked lamp above as well. All lighting is diffused through the white screens and all lamps are 4-5,000K gas filled lamps as described above. Note the lint roller to the left. That blue background always has crap on it! 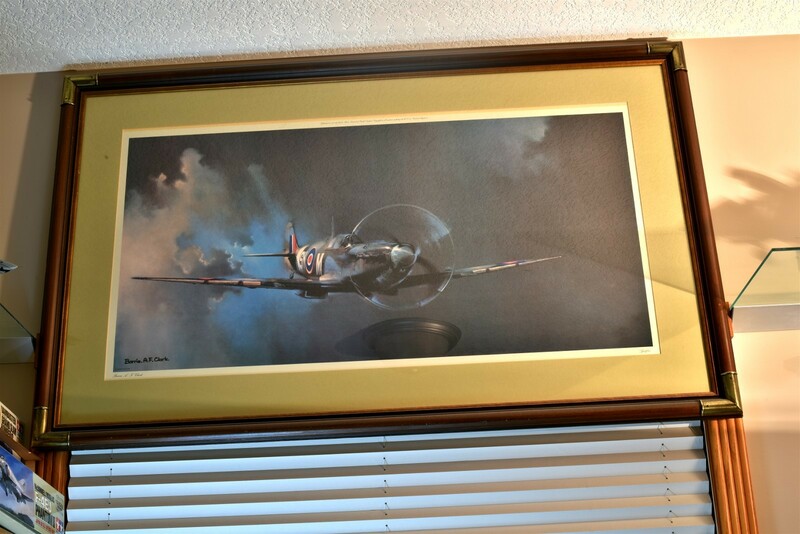 And just for laughs, here’s a print of one of my favorite aircraft over my work area, which provided inspiration for my Spitfire build. My father had this over his own desk 40 years ago and it never gets old. The photos of your desk top set up and the photo booth set up is just what I was looking for!! It's given me some ideas on how to proceed. I used to have that same print...until my wife decided that I didn't need it anymore!! It's a classic. Thanks for the fast and excellent reply!! Quick update. 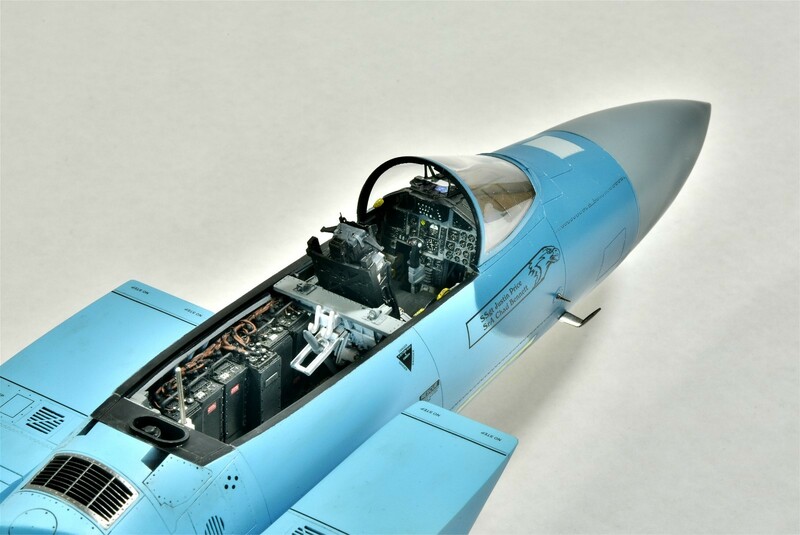 The LSP F-5E SIG had identified a few panel line and other surface errors on this kit, so from now on I'm checking this detail using references of all surfaces and if I can, correcting as many as possible. 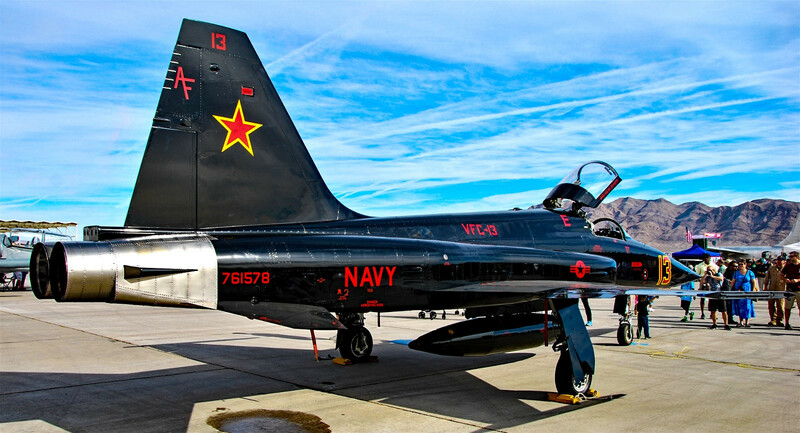 The front starboard side fuselage wall is especially problematic, because just about all of it is wrong. It appears that KH has taken the detail from the port side like the canopy release handle, step panel, water release handle, etc. and just made an mirror image of most of it on this opposite side. 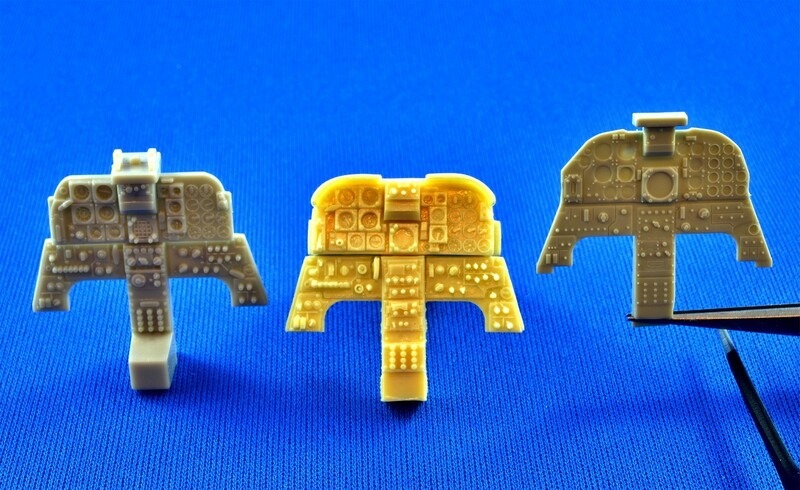 Also, the starboard side is missing the AOA vane, which even Hasegawa supplies with their old kit. Here's what I mean. These details should all be removed and the front two panels should be flipped, with the oval one on the top, which is where the AOA vane should go. I'm changing this now before I paint or detail the interior sidewalls, to minimize possible damage. Using CA glue to fill all the fine detail, I sanded it smooth, then re-scribed every panel line and re-punched every rivet, which I will likely do for the entire model. No biggy, because I kind of like it! 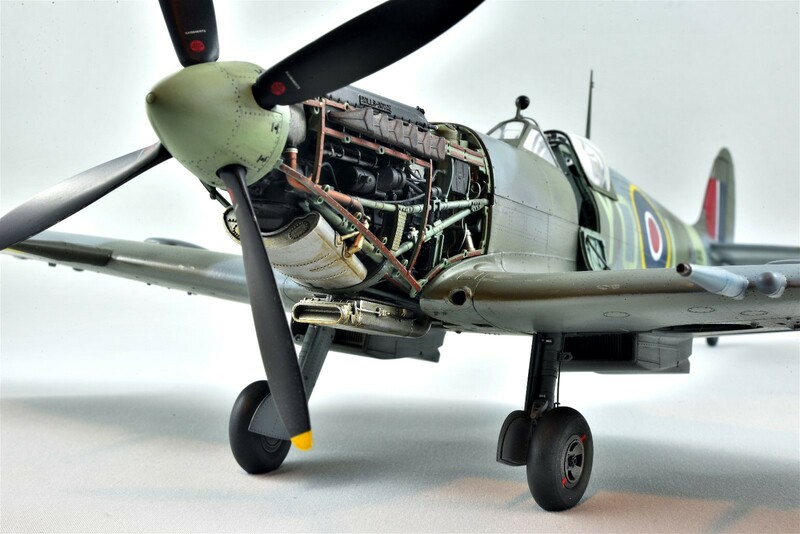 I usually do this for all my models to make the fine detail extra crisp, although the Spitfire required only the addition of rivet detail, rather than fixing the kit ones. 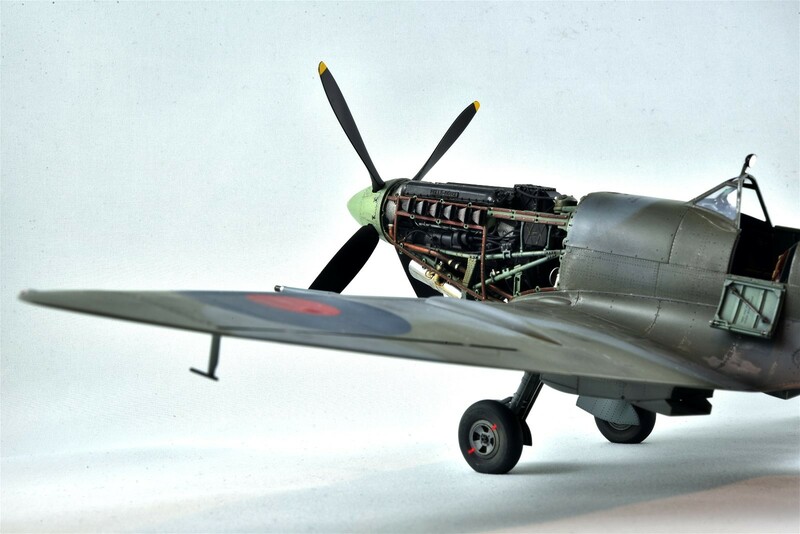 Although I've made the excellent 1/32 Tamiya Mustang before, I think the Tamiya Spitfire might be the best injection kit ever made at any scale. 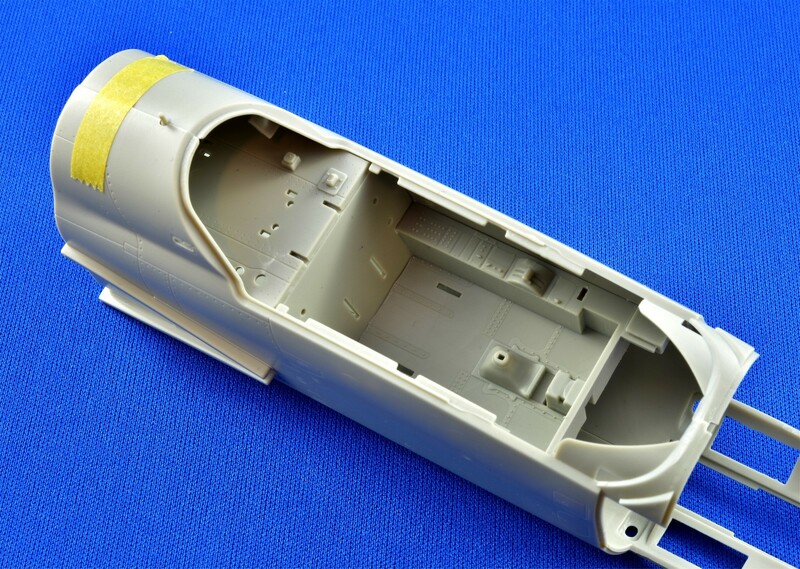 Anyway, here is the port side on the top, which should have this surface detail, while the detail is now gone from the starboard side with the front panels corrected, and the AOA vane inserted slightly off-center within the oval panel from the Hasegawa kit. Now that I look at it again, I should have added two more of those circular static ports just below the rescue panel at the front like the port side. 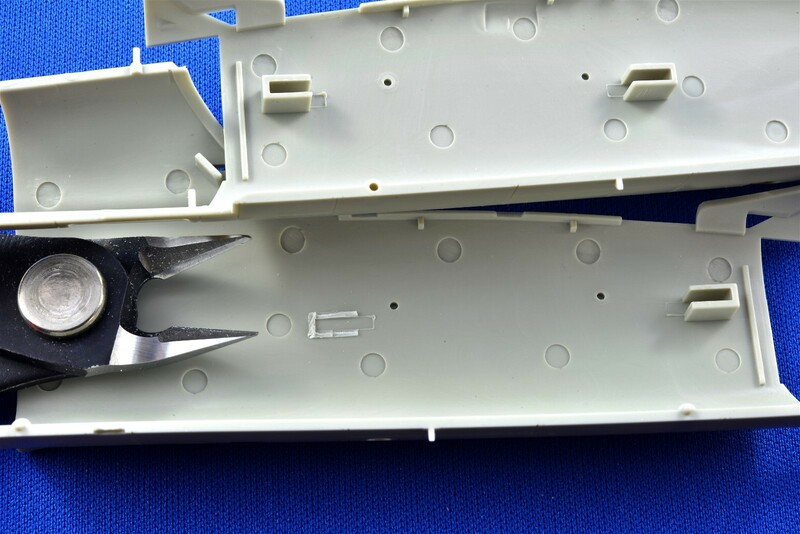 There is also a small square "air scoop" that should be added just ahead of the canopy release handle on the port side. Great catch Chuck and, this is exactly why we do research. Not all model companies get it right. 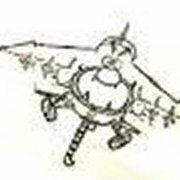 Is Kitty - Hawk related to Trumpeter ?? Trumpeter is known for their kit inaccuracies. Keep up the great work. 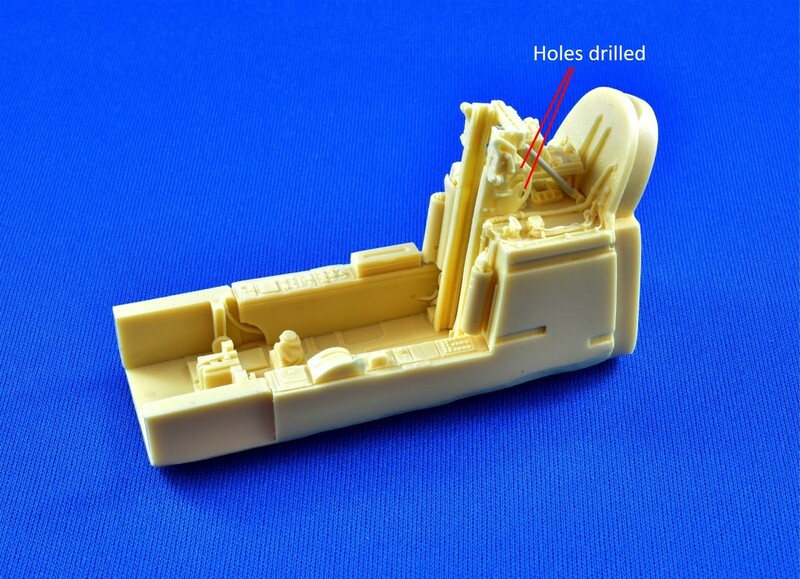 I have no idea Stevie, but if I can build the 1/32 Trumpeter A-10A kit into a decent model, this kit should be a walk in the park. We'll see! 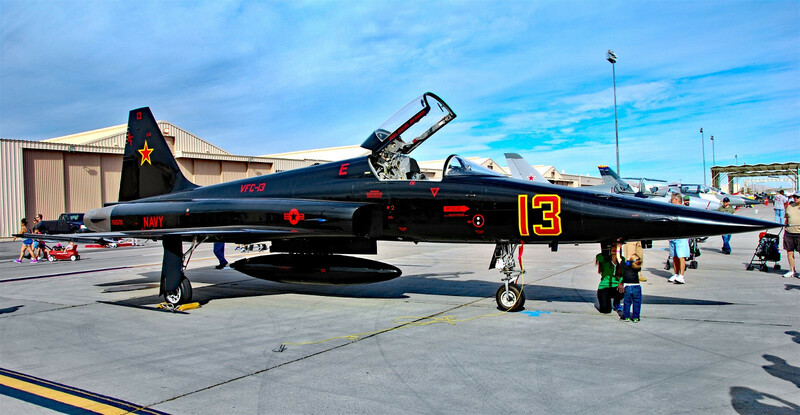 Go black, but if you ever change your mind, take a look to the old Top Gun splinter (1986) and keep the all black finish for "the" black jet F-117. Thanks for the feedback guys. As mentioned, I have lots of time to think about the final paint scheme and in all situations, I will be painting the entire model in gloss black anyway, like I usually do. From there, I can make the final decision as to whether or not I’m done or I add the tiger stripes. Both schemes should look cool, so there is no right or wrong answer. 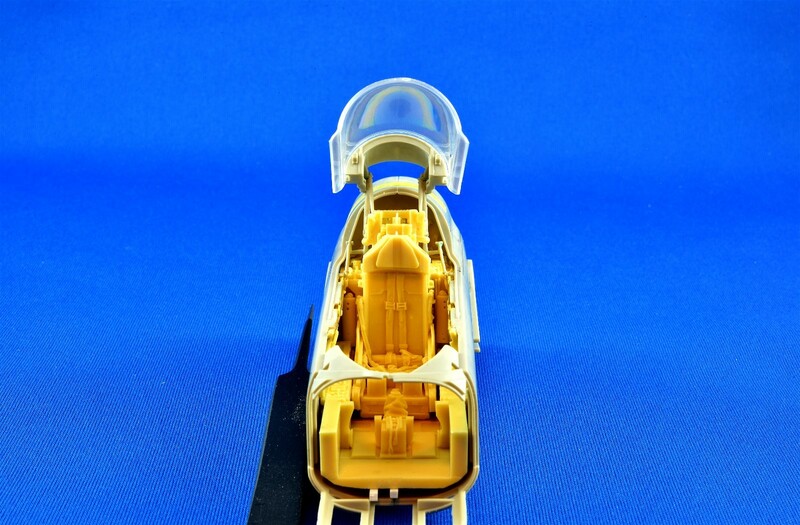 While I have successfully installed the Black Box (BB) resin cockpit into the Kitty Hawk fuselage halves, the remaining big question is how will the canopy parts fit? As mentioned, I have never experienced such a complicated mess of control arms and gadgets to raise and lower a canopy before. Doing lots of dry fitting and eye-ball experimentation against reference pics, I have decided to go with the kit canopy and other parts, modified to fit the BB cockpit. 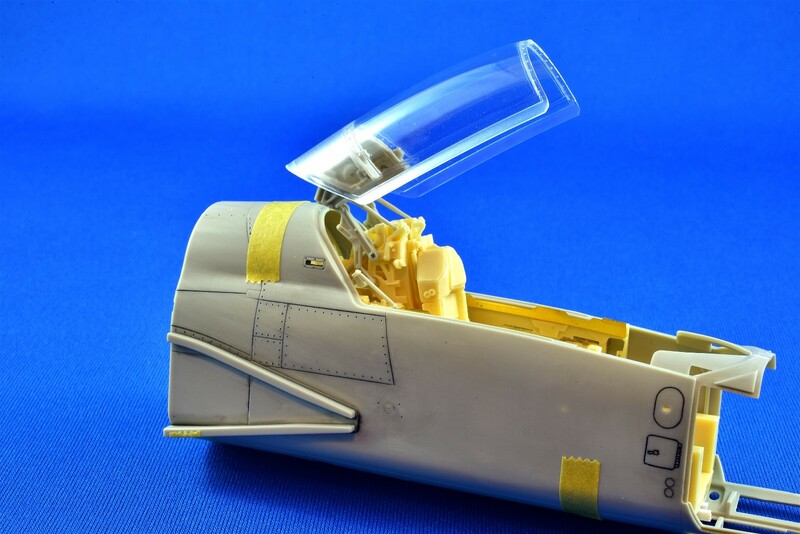 The reasons to do so are simple: The BB canopy parts don’t fit the clear canopy very well and the kit parts are actually quite good and they DO fit the canopy, so why fight it? 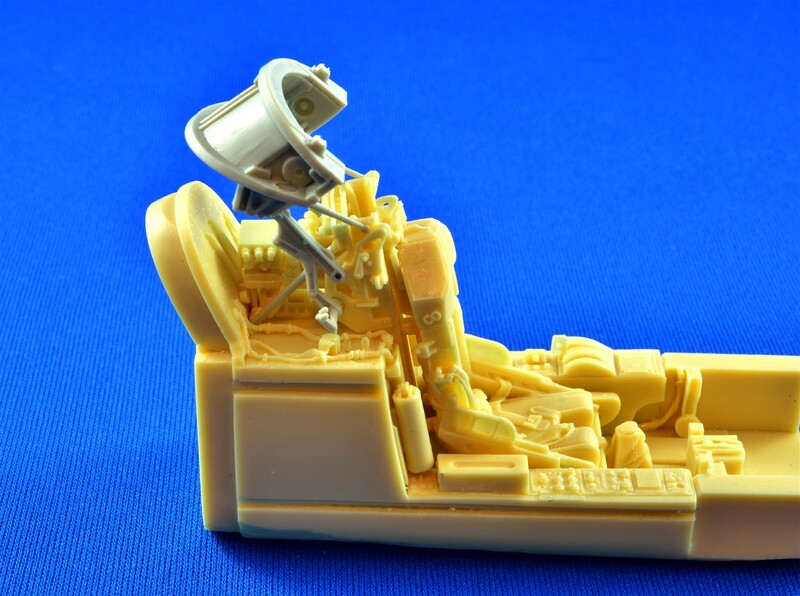 To start off with, the KH kit cockpit has a rear wall too far backwards and all the kit parts are made for this distance, so rear control arms and other bits had to be shortened. In order to get these parts to fit together, I have had to permanently install the seat rails which the canopy fits into and some other stuff behind the seat, because gluing and installing them later will be very difficult without making a mess. This makes painting more difficult, so its always a compromise between ease of painting and ease of final assembly. Here is where I have started, which are the only parts that need to be permanent until final assembly. Please note that not all parts have been cleaned up properly yet, since I’m still experimenting with fit. 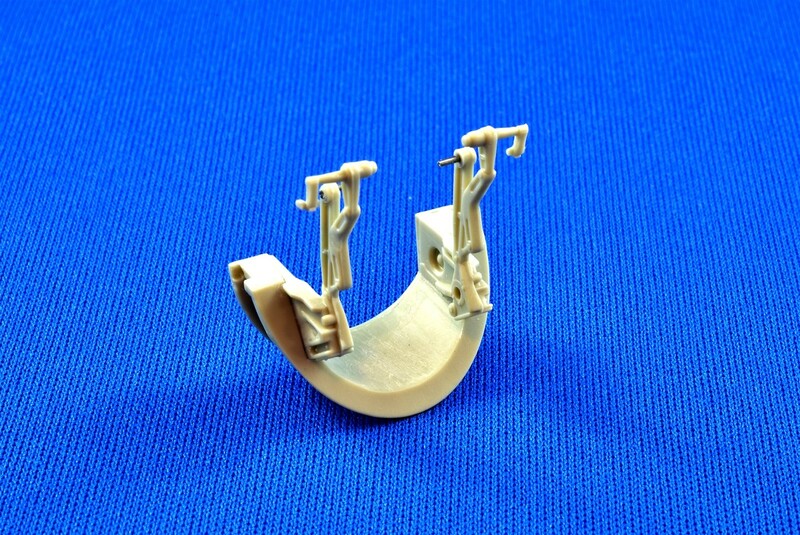 There are two main canopy parts that fit together at the back and in general, they fit terrible and must be trimmed and modified in order to do so. Very weird and further, one of the control arm couplings coming off the left side of the assembly (at back) is missing two tabs to hold the control arm, like it does on the right side (at front), so I have added a couple of beads of CA glue to get things started. This will be modified properly later. 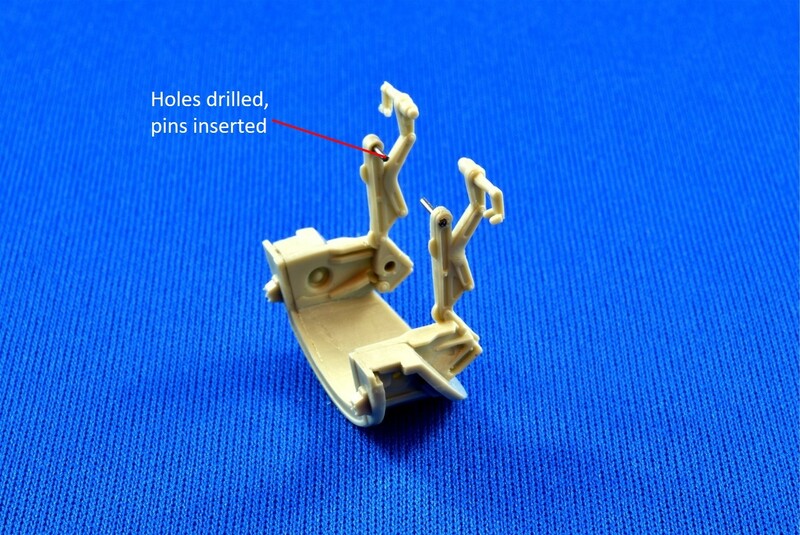 The upper attachment points of the main arms were cut off, drilled out and metal pins were inserted to create a stronger fit. When attached to the cockpit assembly, everything fits pretty good, with some of the control arms “glued” to hold them in place with liquid mask. I will be adding several more smaller control arms at final assembly, since they are much too fragile to add now. 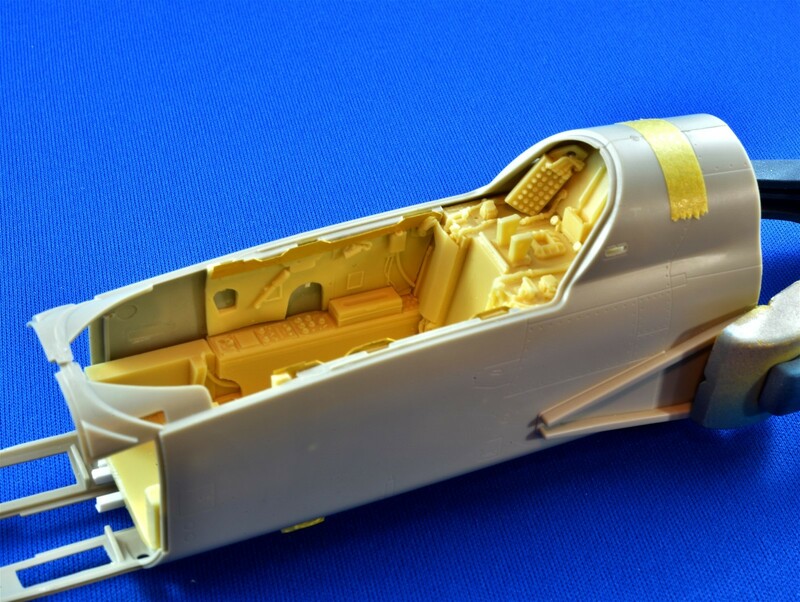 So far, so good, but how will this assembly fit when parked within the fuselage halves with the canopy dry fit on? According to my references, pretty close to bang on….. The alignment from the front was off a bit, because the resin parts are not exactly identical, which initially made my heart skip a beat until I thought of a solution. 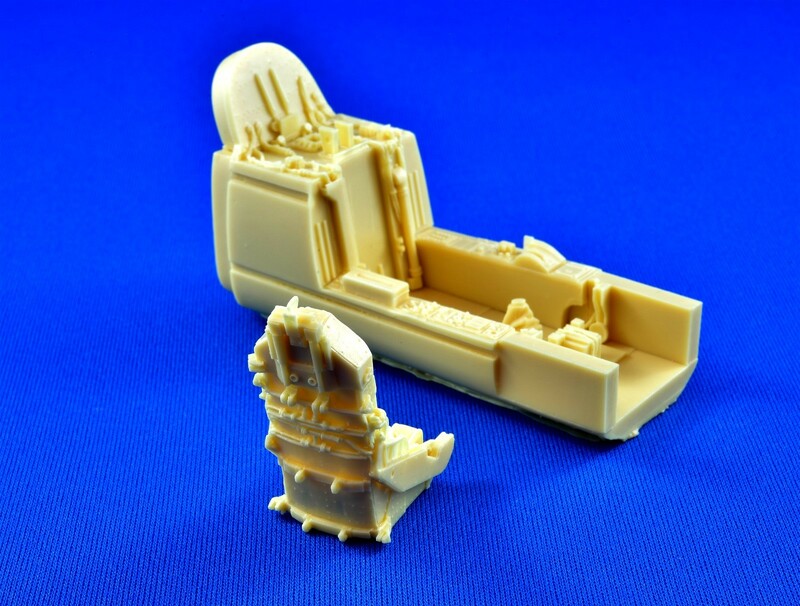 I dunked the top of the cockpit frame and the top of the resin seat assembly into some boiled water for 10 seconds, then carefully pushed the parts back into place. Again, pretty darn good, which will be made even better when I glue the parts in permanently. With the cockpit and canopy parts figured out, the rest of the technical aspects of this build should be fairly straight forward. 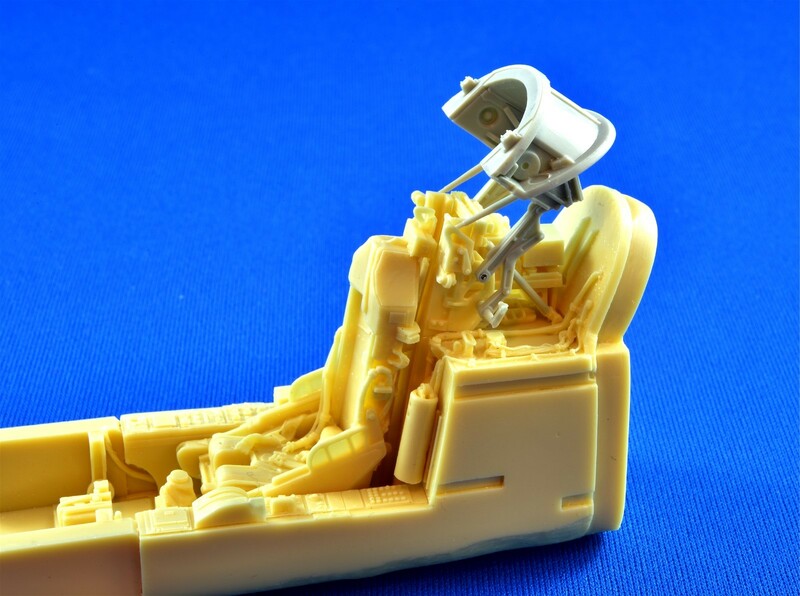 Yeah, I know the front gun doors fit like crap, there’s lots of re-scribing left to do and the chances of actually getting my hands on some seamless intakes is only 50/50 at best. Still, I’m having lots of fun with this kit so far, because it’s the right combination of kit quality (6/10) and my improving skill set to try and create something special. Next up: Lots and Lots of cockpit detail and painting. This could take awhile! Following along. That F-15 cockpit -- I'm weak in the knees. It's just like zapping the real deal with a shrinking ray. Incredible work!